If you wish to send a telegram to another country, please see our International Telegram page. Want to know when your message was delivered and if a signature was obtained? Order a report of delivery. After the delivery is complete we will notify you via phone or mail. Would you like a telephone call with the report of delivery when it becomes available? Would you like a report of delivery sent to you? 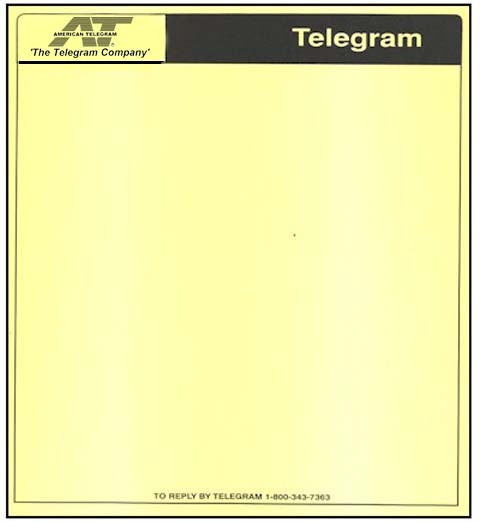 When leaving the Telegram at the location is not enough, request a signature. This signature will become part of your telegram record. Available for most areas. Would you like for our delivery agent to obtain a signature from the accepting party? Yes, I must have the signature. If your message is time-critical, we offer Priority AM Delivery. Do you need Priority AM delivery?